After Winter's Deadly Flu Season, Infectious Disease Experts Ramp Up Warnings : Shots - Health News College students are among the least likely to get vaccinated against the flu, which killed more than 80,000 people last winter. Experts say the reasons are a combination of fear and misperception. Alex Schwartzman, a law student at George Washington University in Washington, D.C., is one of only 8 to 39 percent of college students who get the flu shot in a given year. "Flu vaccinations save lives," Surgeon General Jerome Adams told the crowd at an event to kick off flu vaccine awareness last week at the National Press Club in Washington, D.C. "That's why it's so important for everyone 6 months and older to get a flu vaccine every year." "We have long known that college students are at a particularly high risk of getting and spreading flu viruses," says Lisa Ipp, an adolescent medicine specialist at Weill Cornell Medicine. "Yet, on U.S. college campuses, flu vaccination rates remain strikingly low," she writes in a 2017 post published by the National Foundation for Infectious Disease. The group sponsored a survey of college students and found that only between 8 and 39 percent of students get the vaccine. So why aren't people getting the vaccine? The college survey data point to a mix of misperception and fear. 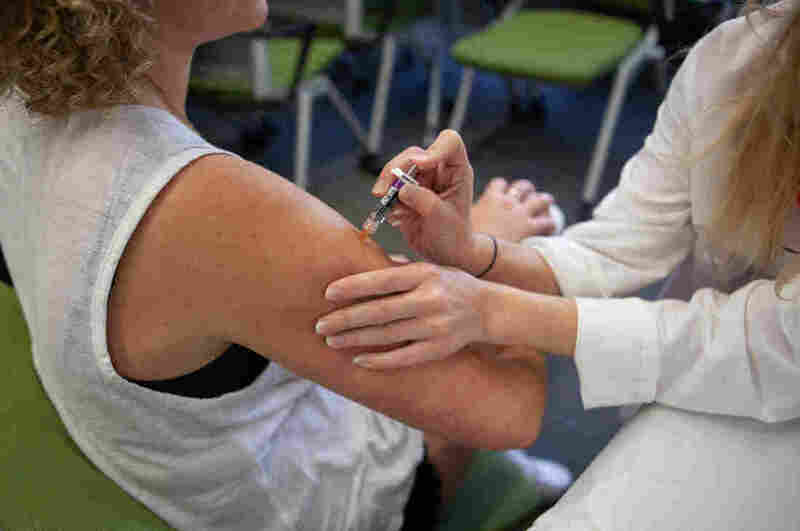 For instance, among students who don't get the vaccine, 36 percent say that they are healthy and don't need it, and 30 percent say they don't think the vaccine is effective. Then, there's the fear: 31 percent say they don't like needles. So, let's do a reality check. If you're on the fence about a flu shot, here are five arguments to twist your arm. People 65 and older are at higher risk of flu-related complications, but the flu can knock young, healthy people off their feet, too. It does every year. "The flu can, on occasion, take a young, healthy person and put them in the intensive care unit," says William Schaffner, medical director at the NFID. And, even when it's not that severe, it's still bad. "If you get the flu, you're [down] for the count for about a week," Ipp tells her college-age patients. Here's a sobering thought: Healthy children die from flu, too. According to the CDC, 172 American children and teens (under the age of 18) died from the flu last winter. Eighty percent of them had not received a flu vaccine. And about half had no underlying illnesses before getting the flu. In other words, they'd been healthy children. And there's this: The flu doesn't just make you feel lousy. It can increase the risk of having a heart attack, according to a study published this year. 2. Getting a flu shot is your civic duty. So getting the flu shot will help protect your family, friends and co-workers. "It's the socially correct thing to do," Schaffner says. 3. You can still get the flu, but you won't be as sick. After last winter's severe season, some people are skeptical. They say: "I got the flu shot, but I still caught the flu." In fact, the 2017-18 season was the deadliest in more than 40 years. "We had a very vicious virus, the so-called H3N2 influenza strain," says Schaffner. And yes, it's true that the vaccine does not offer complete protection. The CDC estimates that flu vaccination reduces the risk of the virus by about 40 to 60 percent. Think of it this way: If you catch the flu, the vaccine does still offer some protection. It cushions the blow. "Your illness is likely to be milder" if you've had a flu shot, says Schaffner. You're less likely to get pneumonia, which is a major complication of the flu, and less likely to be hospitalized. 4. Pregnant women who get the flu shot protect their babies from flu. Women who are pregnant should be vaccinated to protect themselves. The vaccine also offers protection after babies are born. "[Women] can pass the protection on, across the placenta," Schaffner explains. And this will protect their baby during the first six months of life, until the baby is old enough to be vaccinated. 5. You cannot get flu from the flu vaccine. It's still a common misperception: the idea that you can get the flu from the flu shot. The NFID-sponsored survey of college students found that close to 60 percent of students seem to think that the flu vaccine can cause flu. "That's, of course, incorrect," says Schaffner. The most common side effects are a sore arm, and perhaps a little swelling. "A very small proportion of people, 1 to 2 percent, get a degree of fever," Schaffner says. That's not the flu, he explains. "That's the body reacting to the vaccine." Because the flu is unpredictable, it's too soon to know what to expect this winter. But Schaffner has this advice: Don't wait. "The time to get vaccinated is right now," he says. If that doesn't move you, maybe a little reward will. The survey data of college students found that incentives are a good idea. Think: free food, free entertainment or a gift card for a free coffee. 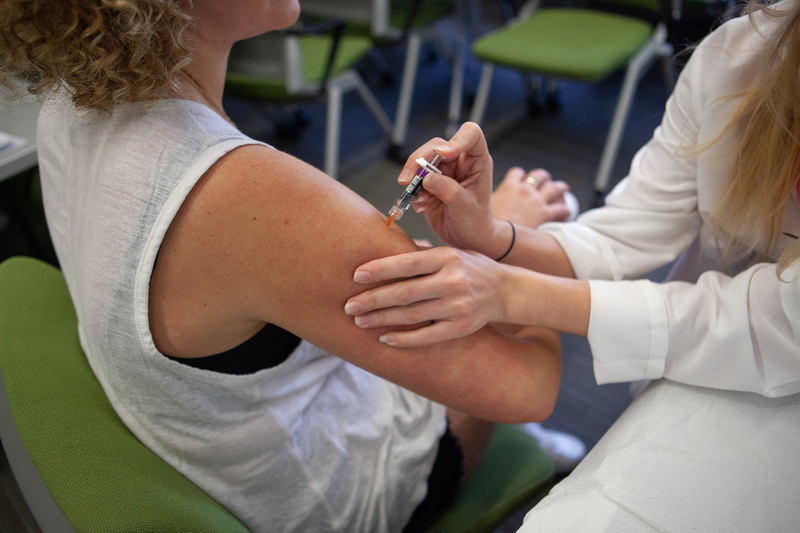 Ipp found about 60 percent of students said these types of incentives would increase the likelihood of their getting the flu vaccine. Another way to nudge people? Make it super convenient. On the campus of George Washington University, the medical director of the student health center has organized flu-clinic pop-ups in venues where students hang out, such as the library. "We don't wait for them to come to us," Isabel Goldenberg told us. For workers in offices, flu clinics at the workplace can be an effective way to encourage vaccination, too. What about the use of social media to motivate people? "I've had the flu, which was horrible," Max Webb, a student at George Washington University, told me. He thinks if people shared their flu stories, it could help nudge people in their social networks to get the flu shot. And what would you name this campaign, I asked Webb? "Say boo to the flu," Webb replied. Or simply, #boo2flu.